At AAMCO Transmission and Total Car Care of Greensburg PA, we take the time to thoroughly diagnose your transmission problem, and then create an effective plan for repair. During our exclusive Transmission Scan service, we will check the level and condition of your transmission fluid, transfer case, and differential fluid (where applicable). We will also take your car for a test drive in order to better understand your vehicle’s initial engagements, drive range, upshifting and downshifting timing and quality, passing gear, TCC engagement, and 4x4 performance. We’ll also test your vehicle in neutral, park-hold, and reverse and feel for vibrations and listen for any strange sounds. It is because of this thorough approach using state-of-the-art diagnostics that we can pinpoint the exact cause of your transmission problem and repair only that problem, saving you time and money. In fact, more than half the vehicles we service only require a minor repair. Other repair shops can’t say the same. 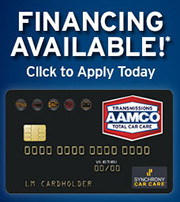 Come to AAMCO Transmissions and Car Care of Greensburg PA to expect honest, thorough, and skilled service every time.